In yesterday's Sunday Times, a report from Francistown in Botswana. Sometime last week, in the middle of the night, a car, a white American model, drove up to a house in a residential area. Men wearing balaclavas jumped out, kicked down the front door, and began shooting. When they had done with shooting they set fire to the house and drove off. From the embers the neighbours dragged seven charred bodies; two men, three women, two children. From that first paragraph, you would imagine that this book would deal heavily with the troubles that occurred in South Africa during the seventies. However, apart from a few minor references to Nelson Mandela's imprisonment and apartheid, this book barely touches the issues occurring during those years, they take a back seat to the story of Coetzee's life. country. I have to say, I find this book difficult to describe. It is written as an autobiography, yet it appears to be written in a fictional style. The book begins with random diary entries, followed by interviews with people who were important to Coetzee. That all sounds quite normal you may think, until you realise that the people chosen are being interviewed by a fictional English biographer and Coetzee is supposed to be dead. The book is the third in the series of autobiographies, following the previous two books, Boy and Youth. 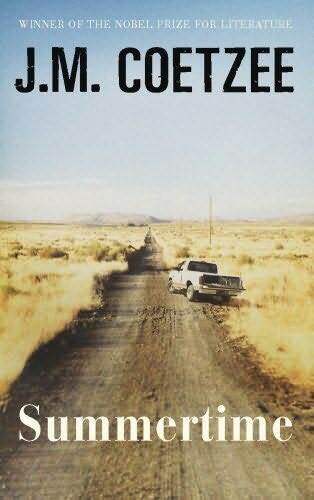 This book looks at the years 1972 to 1977, where Coetzee is back living with his widowed father in a run down house and his life seems to be going nowhere. This is viewed as the time period, where Coetzee was just trying to 'find his feet as a writer'. For all of us would be writers, I found that quite comforting, as it shows how downtrodden he became before he made it as a writer. It made me feel like my doubts and procrastination are quite common factors amongst writers. Coetzee seemed to have reached the lowest part of his life and you get the impression he is just moving further and further into the darkness. The prose is bleak and depressing, but you know from fact that Coetzee goes on to be a successful writer, but this period in his life was dark and miserable. There is hope for us all who seek the road to a successful career in writing. This book was interesting to read, I can't say I loved it, but I did enjoy reading how Coetzee perceived his friends to see him. I felt that during that time period, Coetzee didn't actually like himself very much, as he makes his character sound quite pitiful and sad. The characters who talk about him are quite dismissive of him, no one appears to think that highly of him, even the woman whom he had an affair with didn't really have anything nice to say about him. I suppose Coetzee makes himself look human, by showing his annoying habits and his unrequited love for a woman, who nearly had him arrested as a stalker. He comes across as real, nothing is hidden from view, what you see is what you get. No facade, no cover ups, just Coetzee as he saw himself during that time period. If you enjoy biographies, then I would suggest reading this one, but I would definitely view it as a biography with a difference. I like the way it was written, I like the way Coetzee viewed himself from another person's perspective. I am curious to read the other two biographies, but I didn't feel that they needed to be read in order to read this book. My only real concern with this book, is that I didn't feel like it actually went anywhere. I don't feel that Coetzee had reached a certain pivotal point in his life by the end of the book and he appeared to have just drifted through these selected years. I came away from the book wanting more, needing a conclusion in words that his life got better. I know that his life did improve dramatically, but I wanted to read about it within this book. Another Man Booker Short List book down and only three more to go. Will I finish this challenge by the end of the year. Hmmm, not sure when I have two chunksters like The Children's Book and Wolf Hall left to read. Keep your fingers crossed for me. Not a book I wanted to read (I'd read lots of reviews all of which had used the word confusing)but your review has me reconsidering. I read a book that rambled in the same way and it left me feeling dissatisfied as well. I've been wanting to read Summertime but have not gotten my hands on it yet. I have only read a couple of his books and have found them so wonderful. Hard to read at times but they just really force me to analyze them. Have you read Disgrace? In particular I recommend that one. Like Amanda, I'm slightly intimidated by Coetzee. Hopefully I'll get over that sometime? I found this book fascinating and one of the most thought-provoking I had read for some time, for the things it did with style. Coetzee is confusing in this context but it amazed me how fascinating I found Disgrace (the first of his books I read last year); it was both accessible and outstanding.